The first Easy Angel Crafts Handkerchief Angel shown below was made using a pretty handkerchief with embroidery and cut-work on one corner. 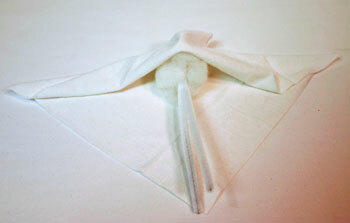 But, this second angel uses a piece of fabric cut from an old white knit t-shirt. The steps are simple and the materials inexpensive. 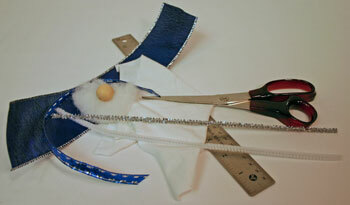 If not using a finished handkerchief, cut the fabric square. 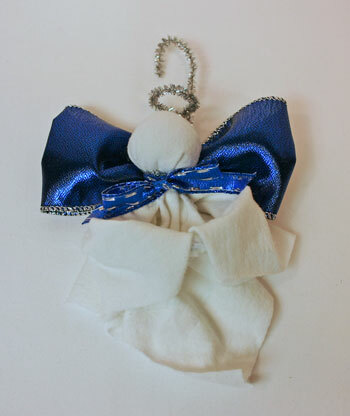 An eight-inch square makes a smaller, more dainty Easy Angel Crafts Handkerchief Angel. 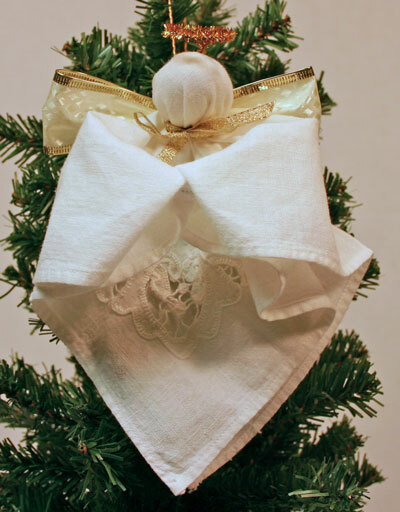 The ten-inch square angel makes a larger presentation wherever you choose to hang the angel. Cut the ribbon, eight inches for the narrow neck ribbon and twelve inches of the wider ribbon for the wings. 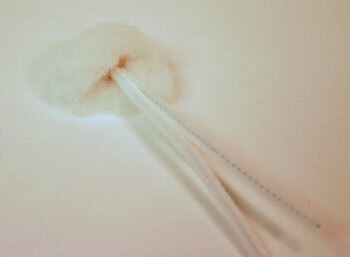 Fold the white chenille wire in half. Wrap the fiberfill around the wooden doll's head. Fold the square in half diagonally. Insert the doll's head into the middle of the fold. 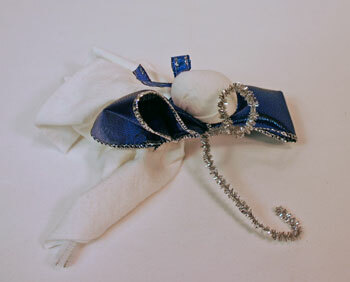 Wrap the silver chenille wire around the fabric just below the wooden ball forming the angel's neck. Twist the wire ends to secure. 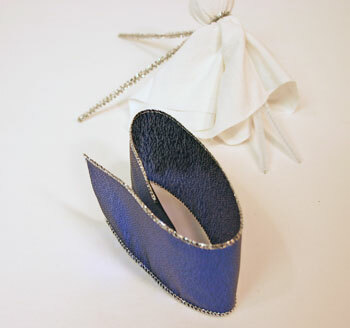 Fold the ribbon with the ends overlapping in the middle of one side. 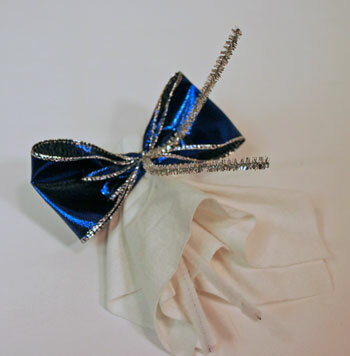 Pinch the middle of the ribbon to begin forming the angel's wings. Position the ribbon between the wire ends. 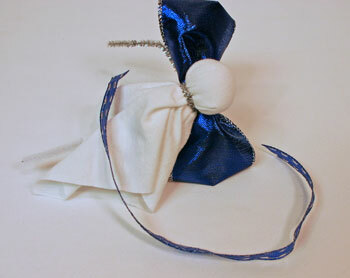 Twist the chenille wire over the ribbon to add the angel's wings. 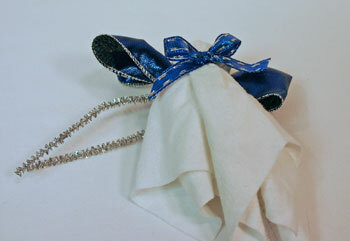 Wrap the narrow ribbon around the Easy Angel Crafts Handkerchief Angel's neck over the silver chenille wire. 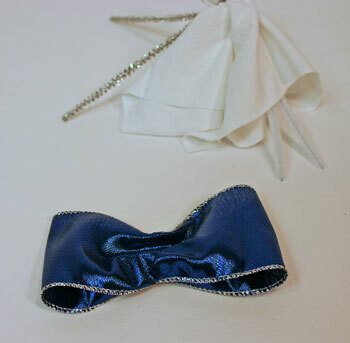 Tie a bow under the head on the front (the side opposite the wings). 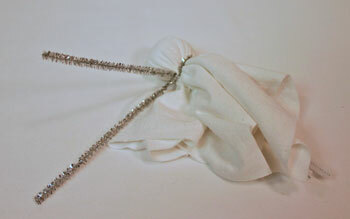 Wrap one end of the silver chenille wire around your finger to form the halo. Join the end back onto itself to complete the halo's circle. Make a half circle in the other end of silver chenille wire. This forms the hanger for the angel. 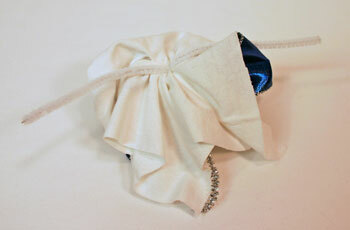 Fold the fabric back to reveal the white chenille wire ends. 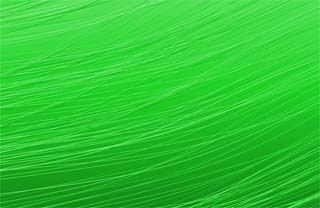 Form a circle with the chenille wires. Join their ends by clasping and bending the wires back on themselves. 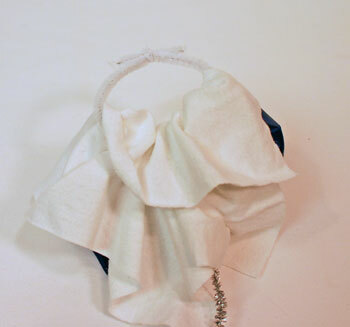 Fold the fabric back over the circle of chenille wire to form the Easy Angel Crafts Handkerchief Angel's arms with clasped hands. 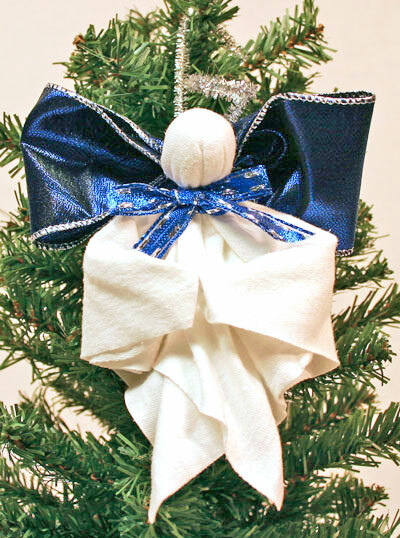 It may have started as a piece of old t-shirt material, but the finished angel looks pretty hanging on the tree. 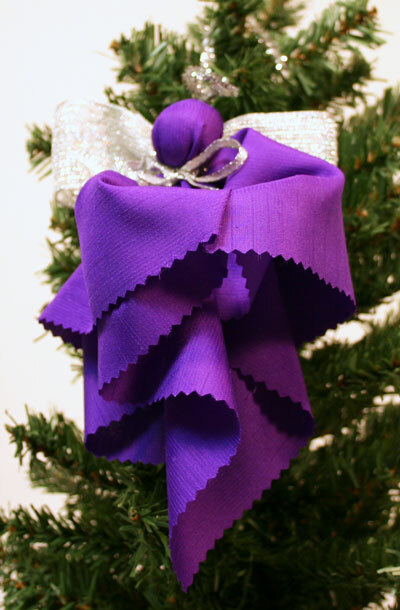 This next Easy Angel Crafts Handkerchief Angel was made with a small scrap of purple fabric and silver neck and wing ribbons. Rather than hemming the edges, pinking shears were used to cut the edges to prevent the fabric from raveling. A few materials and simple tools provide an afternoon's fun for children and adults alike. 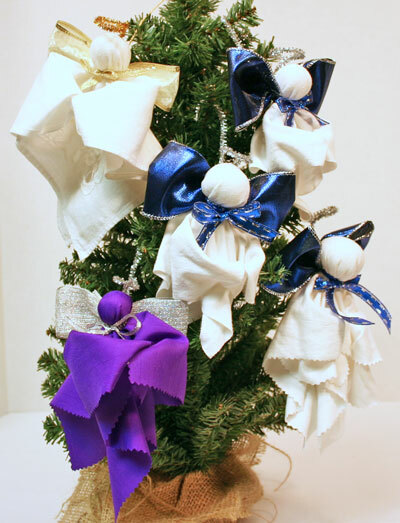 Whether made with handkerchiefs or with scraps of fabric, these Easy Angel Crafts Handkerchief Angel projects are easy and fun to make.